Please note shortened winter hours are currently effective (as of January 4, 2019). Hours are posted on the Home Page. The current daily rate for boarding a dog is $30 per day. We charge the same rate for all breed types because we feel every dog gets the same amount of care and attention regardless of size. Multi-dog families that can board together in the same run are priced $30 for the first dog and $25 per additional dog. Multi-dog families requiring separate dog runs must pay $30 per dog. The current daily rate for boarding a cat is $17 for a standard-sized space or $27 for a luxury-sized space (condo). Multi-cat families that board in standard-sized compartments are $17 per cat because we don’t board more than (1) cat per compartment. Multi-cat families that occupy the same condo (up to (3) cats max with (3) levels) are priced $42 for (2) cats and $51 for (3) cats. The daily rate is inclusive of everything except medication. To view medication charges for dogs and cats click on either the dog boarding or cat boarding tabs and scroll down to the medication category. 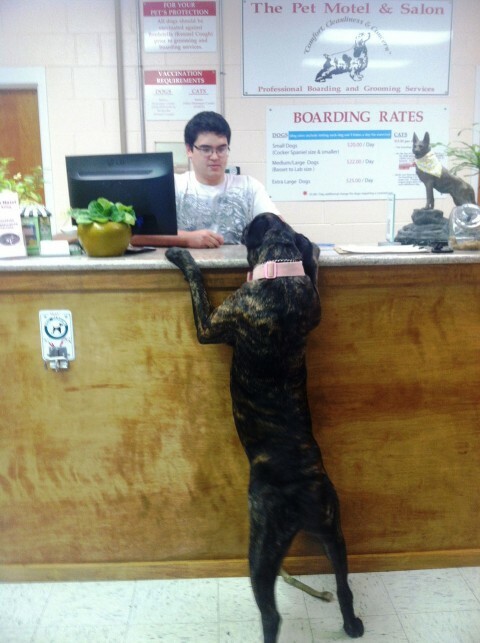 Pets can be checked in or out during our normal business hours (Mon 8-5, Tues-Fri 8-5:30, Sat 8-4, and Sun 3-5). The boarding fee starts immediately the day your pet is checked in regardless of the time of day. You can check your pet in at any time during our business hours. Our check-out time Monday through Saturday is by 12:00 noon. A full day’s board fee will be charged for pick-ups past 12:00 noon Monday through Saturday (pets can be picked up until our closing hours during those days). For example, if you check your pet in Tuesday and pick your pet up after 12:00 noon Friday, you will be charged for (4) days boarding. For your convenience, we allow after 12:00 noon pick-up times for all pets getting a bath or haircut on the date of departure Monday through Saturday (without being subject to that day’s boarding fee). However, if you modify your original departure date and do not notify us before your pet is groomed (for example, calling the day of departure), the 12:00 noon check-out policy applies to the new departure pick-up date with applicable boarding fees. Calling us the day before departure to make changes would be sufficient notice. Please keep in mind that we are open at 8:00 a.m. Monday through Saturday allowing pet owners (4) hours to pick up their pets before being charged for the pick-up day. Pets staying past 12:00 noon occupy boarding space and require additional care throughout the day. We automatically charge a full day’s board fee for any Sunday pickups. For example, if you bring your pet in Friday and pick up your pet Sunday, you would be charged for (3) days boarding. The Thanksgiving Holiday period covers the Wednesday before Thanksgiving Day through the Monday following Thanksgiving Day. A boarding reservation that requires any dates covered during this period will require a deposit of $60 per dog run booked or $34 per cat enclosure booked ($54 deposit for any cat condo booked). We require cancellation notice (by phone) by the Saturday before Thanksgiving Day for a full refund on the deposit. Failure to provide the required notice will result in forfeiture of the deposit. We are closed Thanksgiving Day. The Christmas/New Years Holiday period covers the 23rd of December until January 2nd. A boarding reservation that requires any dates covered during this period will require a deposit of $60 per dog run booked or $34 per cat enclosure booked ($54 deposit for any cat condo booked). Boarding reservations booked with an arrival date of December 23rd or sooner will require cancellation notice (by phone) by December 19th for a full refund on the deposit. Boarding reservations starting the 26th or later will require 5 days’ notice (by phone) from the start date of the reservation. Failure to provide the required notice will result in forfeiture of the deposit. We are closed December 24th, December 25th, and January 1st. The Spring Break Holiday Period is based on the public school system’s break period for both the City and County and may or may not include Easter Sunday. The period will cover both weekends before and after the break period. A $60 deposit per dog run booked and $34 per cat enclosure booked ($54 deposit for any cat condo booked) will be required for pets booked with any dates covered during this holiday period. 5 days’ notice (by phone) from the start date of the reservation is required for a full refund on the deposit. Failure to provide the required notice will result in forfeiture of the deposit. We are closed Easter Sunday. For boarding reservations made during these holiday periods, we require a deposit of $60 per dog run booked or $34 per cat enclosure booked ($54 deposit for any cat condo booked). We require 5 days’ cancellation notice (by phone) from the date of the actual holiday to receive a full refund on the deposit. Failure to provide the required notice will result in forfeiture of the deposit. We are closed Memorial Day, July 4th, and Labor Day. The summertime period starts from Memorial Day through Labor Day. A boarding reservation made during the summertime period will require a deposit of $30 per dog run booked and $25 per cat enclosure booked. We require 3 days’ cancellation notice (by phone) from the start date of the reservation for a full refund on the deposit. Failure to provide the required notice will result in forfeiture of the deposit. If you are booking a reservation during the three summertime holiday periods (Memorial Day, 4th of July, or Labor Day) please be aware that cancellation requirement is different and explained under holiday cancellations.